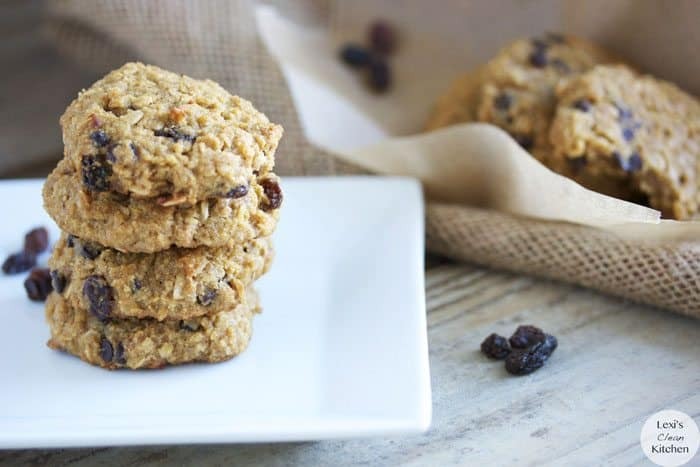 These Oatmeal Raisin Chocolate Chip Cookies are so perfectly chewy, soft, and delicious! The combination of cinnamon, chocolate, and raisins in these are heaven. No one will be able to tell that these are gluten-free and refined sugar-free! This weekend my family gathered to remember the life of my loving grandmother. As hard as the past few days have been, we try and feel comfort having our family and friends by our side. I got to spend some quality time with my siblings. 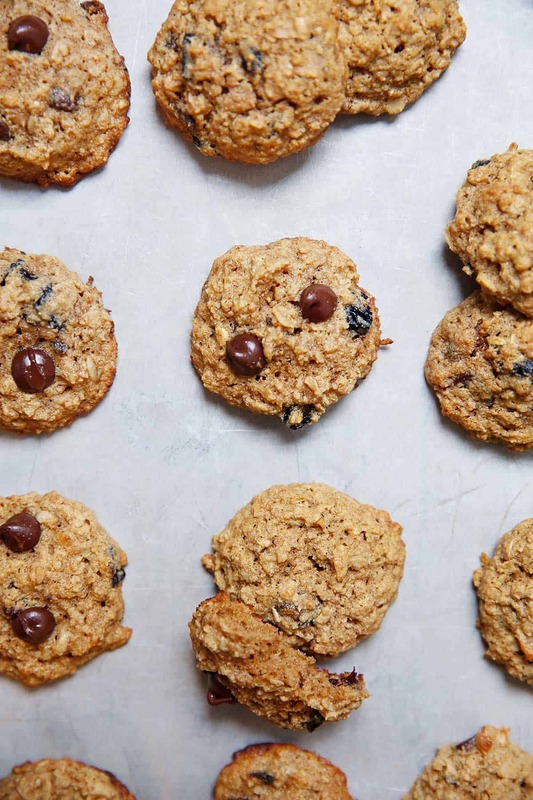 When my younger brother came across my Chocolate Chip Pumpkin Cookies, he immediately requested a healthy version of Chocolate Chip Oatmeal Cookies (his favorite), and of course I set out to do just that. What’s more comforting on a cool Fall day then a nice chewy oatmeal cookie with a glass of almond milk? For my paleo friends out there: GASP! Oatmeal cookies? Oats? That isn’t paleo! Yes, yes, I am aware. If you’ve read through past posts of mine you know I don’t like treat a diet like a religion. Right now I may not eat grains, but many do! Do what fits your lifestyle. 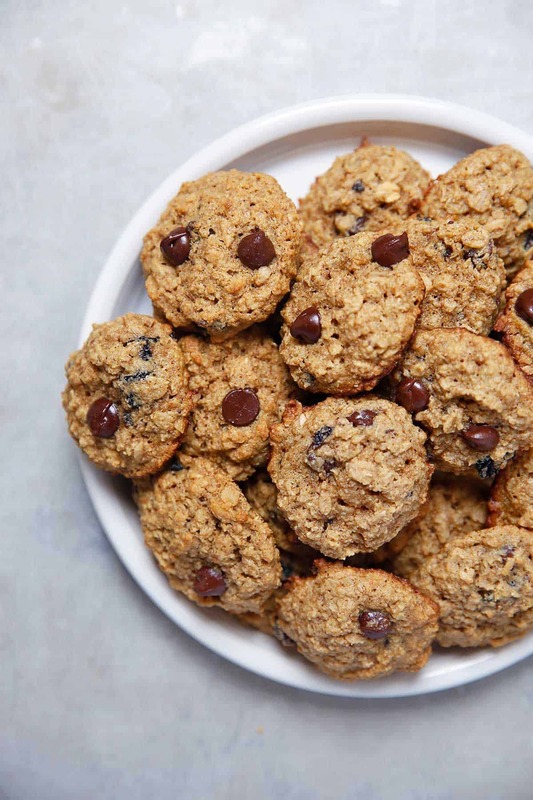 These cookies are gluten-free, dairy-free, and free of refined sugar; but if you are strict paleo you know that grains, such as oats, are avoided. 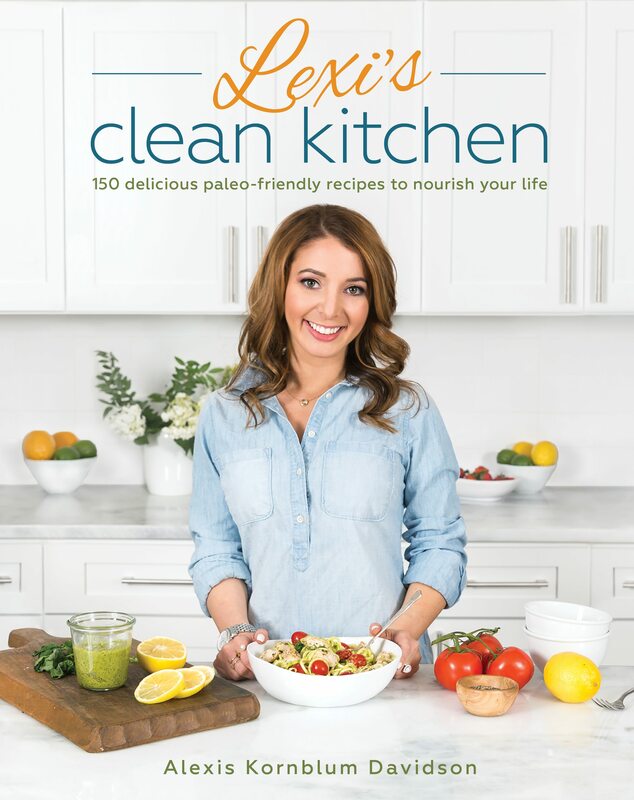 Yes, I eat and cook paleo-friendly, and 99.99% of my recipes here are paleo-friendly, but this one has oats! So if you’re not down with the oats (like me, most of the time- with the exception of these babies), skip over this yummy one! 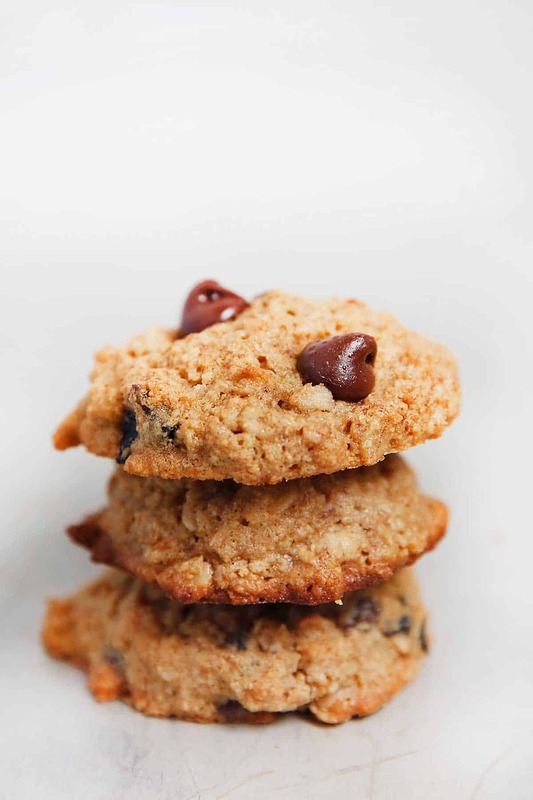 Otherwise, you won’t be disappointed with this deliciously chewy cookie loaded with chocolate chips and raisins! Seriously, you won’t, these were a hit! In a food processor, pulse 1 cup oats a few times and pour into a medium mixing bowl. Add the rest of the oats, almond flour, baking powder, baking soda, salt, and cinnamon to the mixing bowl with the ground oats. In a separate medium mixing bowl, cream together butter and sugar using a hand mixer. You can use a stand mixer here as well. Add in eggs and vanilla and whisk until just combined. Pour butter mixture and applesauce into dry ingredients and mix well. Mix in chocolate chips and raisins. Roll into balls and gently pat down on baking sheet. Let cool on a cooling rack and serve! Your recipes are amazing! I have been following you on Facebook and sharing hour link with my friends! Thank you! I have a question about the oatmeal raisen cookies. My 6 year old daughter has a tree nut allergy and therefore limits my use of almond flour. What is a good substitute? I am so happy you are here Anna! Thank you for sharing. You can use any flour you’d like (or any you have on hand)! What can i subtitute the coconut palm sugar with? Can brown sugar work? Brown sugar would work just as well! Delicious cookies! Thanks for the recipe! Can’t wait to share them at my daughter’s 2nd birthday party tomorrow! That just made my day! I hope all the little ones like them! Have fun tomorrow! 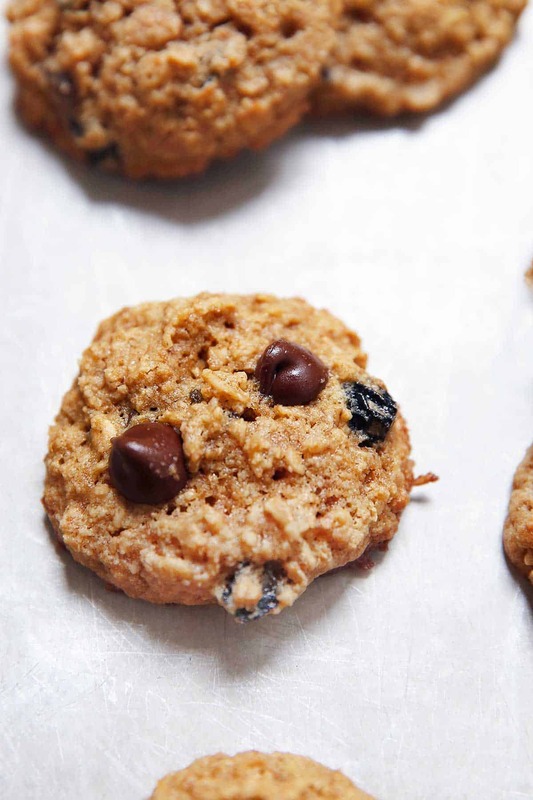 Love love love these cookies….I used the coconut oil instead of the butter and just dark chocolate chips and no raisins. Soo delish. Gave me that chocolate sweet fix that I needed and didn’t feel guilty. Thanks for the awesome recipes. I love to bake and didn’t want to stop baking in order to get healthy and lose weight so it makes me really happy when I find recipes like this. Hi Lexi!! Love, love, love this recipe. Thank you! I have one question for you. Would you happen to know how many calories one cookie would be? Hi! I’m super excited to try these this weekend, but I have a question. I have Bob’s red mill almond flour/meal. I was wondering if I could use this instead and if I should forego the grounds oats if I do? Thanks! Also i didn’t have applesauce. So I swapped the applesauce for trader joes whipping cream. It shined through in taste and smell. 7 months preggo and HAD to have oatmeal raisin cookies. These were PERFECT. I have made several other of your recipes as well. You have a gift. Thank you for sharing it! These were so good! Thanks for the recipe! You mention the coconut sugar in two separate steps. Which is the best way? Creaming with butter, or adding to dry ingredients? I saw the same mistake regarding sugar being in two places in the recipe. I mixed it with the butter – the cookies were yummy but not very sweet. How did other make them? 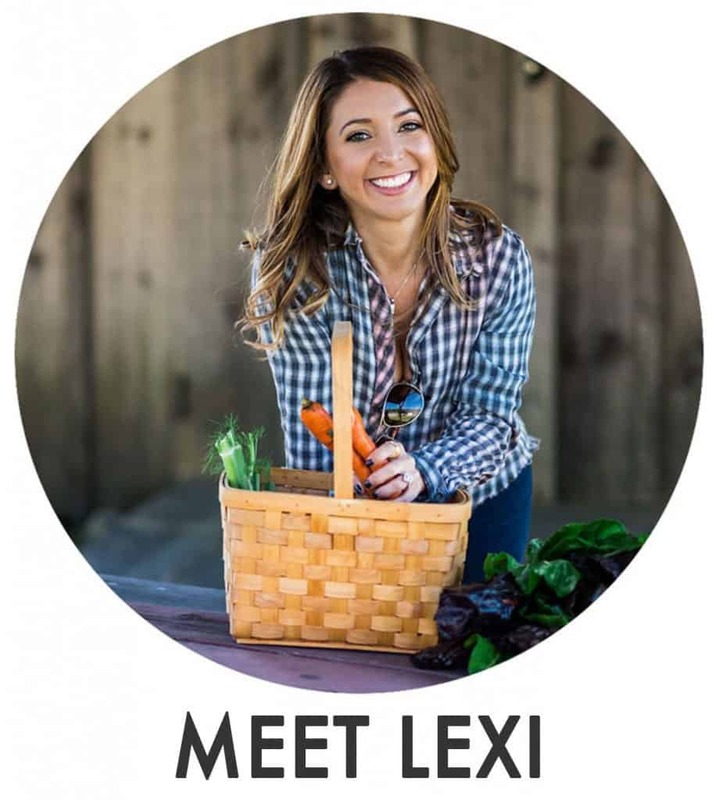 and thanks Lexi for such a great recipe! I just wanted you to know that I use your site (literally) every day. Your muffins have made my family so happy and your pancakes can’t be beat. You are truly a master of healthy baking. 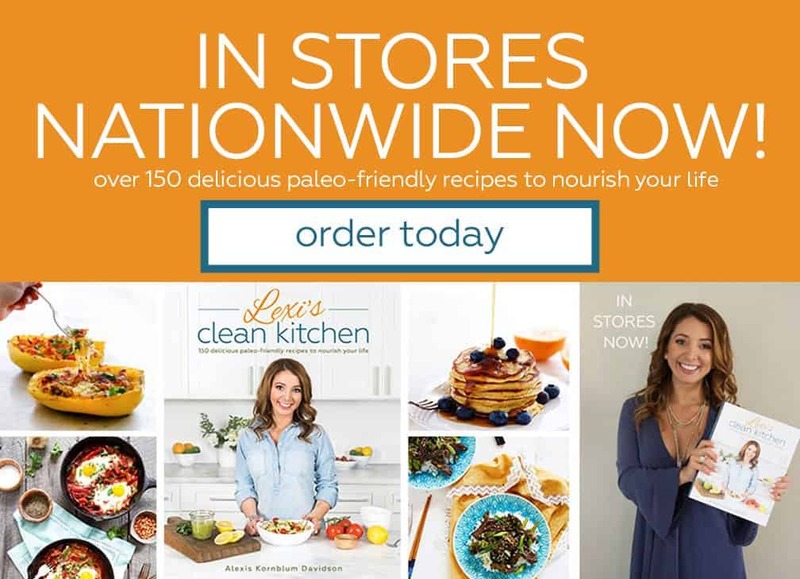 I can’t wait to try every recipe on here! Thank you for sharing your talents with the world!! hi – can I use maple syrup in place of the coconut sugar? Hi, I just found your blog after doing a search for healthy oatmeal cookies. We made these tonight and they turned out well. Thank you! Off to check your other recipes now. The first time I made these they were amazing. The second time delicious but totally fell apart. What did I do wrong? I have made these several times and i just made them again and the dough is crumbly and does nothing when I try to bake it. Is it because I used melted butter? Would love to salvage the dough…..any suggestions?